Mac’s backup application, Time Machine, takes snapshots of your Mac’s storage drive so that you can view its exact condition from two hours ago, two weeks ago, two months ago, or even further back. To use Time Machine, you need to connect an external hard drive to your Mac with a USB or Thunderbolt cable, or you may have an additional hard drive installed in one of the additional drive bays inside an older Mac Pro desktop computer (the new 2013 Mac Pro models don’t have multiple drive bays). If you use an external drive that doesn’t have its own power supply, connect your Mac to a power supply because your Mac supplies the juice to the external drive. When you plug in a new hard drive, the Time Machine backup feature typically starts automatically and asks whether you want to use the hard drive to back up your Mac. Another choice asks whether you want to encrypt the backup disk, which will scramble the data until you access it. Otherwise anyone who gets his or her hands on your external backup drive can read your data. If Time Machine automatically runs and prompts you as described, skip to Step 3. If Time Machine does not prompt you, continue to the next step. Choose Command→System Preferences and then click the Time Machine icon to open the Time Machine preferences pane, as shown in this figure. A dialog appears, listing all available external hard drives you can use, as shown in this figure. Select an external hard drive and, optionally, select the Encrypt Backups check box if you want to encrypt the files saved to your backup drive. Click the Use Disk button. Click the key button if you want help creating a password or go directly to the next step. 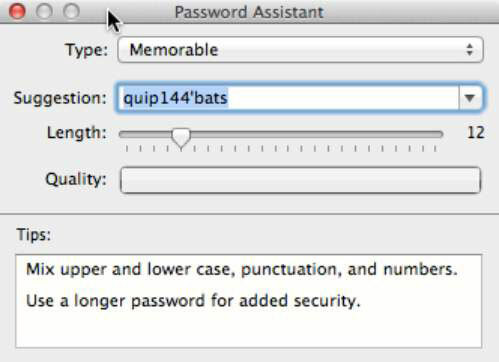 Password Assistant (shown in the following figure) opens and rates the security (quality) of your password. Manual lets you create your own password, or choose a type from the pop-up menu to see and select suggested passwords; drag the slider to define the password length. When you see a password you like, simply close the Password Assistant window and the selected password is assigned. Type a password in the first field and then type it again in the second field to verify it. If you forget your password, you can’t restore your Mac from your backup drive, so choose wisely. Type a password hint in the third field. 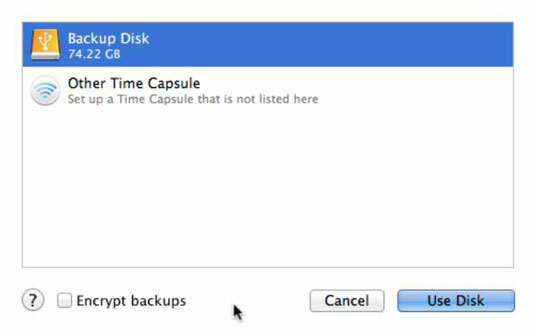 Time Machine prepares your backup disk for encryption. After preparing the drive, the Time Machine pane appears again, listing your chosen external hard drive, and after a short amount of time, the Time Machine application begins backing up your Mac’s data to the external hard drive you selected. (Optional) Select the Show Time Machine in Menu Bar check box if it isn’t already checked. With this option checked, the Time Machine icon on the menu bar animates with a twirling arrow whenever Time Machine is backing up your Mac’s data. 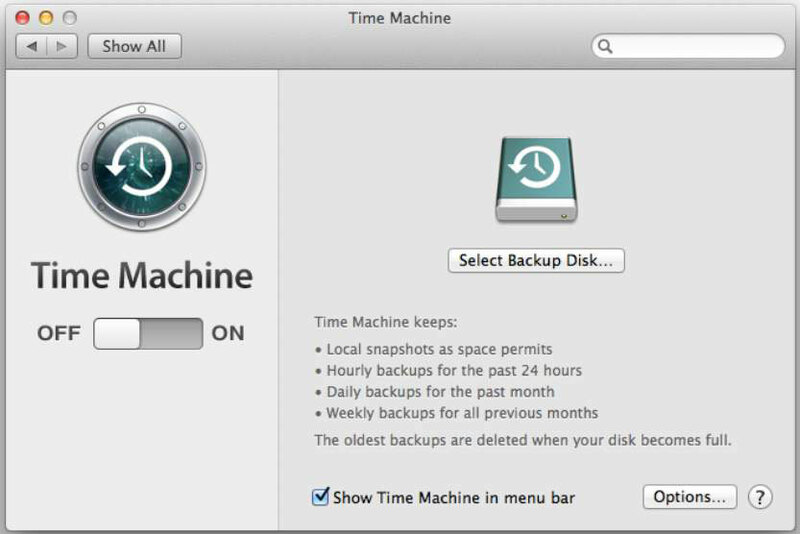 Clicking the Time Machine icon at any time (see the following figure) is how you can keep tabs on the status of an active backup, start or stop a backup, and choose the Enter Time Machine command to run the Time Machine recovery application. Click the Close button to close the Time Machine preferences pane. Don’t interrupt Time Machine during the first backup. You can continue working while Time Machine runs in the background.